Timan Garh Fort is a famous historical fort situated near Hinduan block in karauli district of Rajasthan. 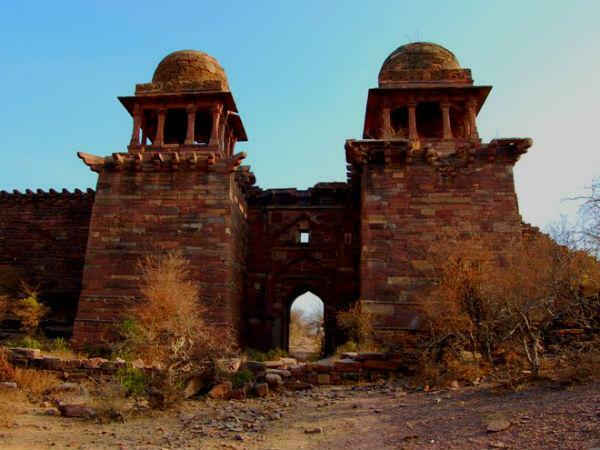 Historians believe that Timan Garh Fort was built in 1100 AD but this destroyed soon by an attack. The Yaduvanshi Raja Timanpal has a great contribution to reconstruct the fort; this is why the fort derives the name of Timanpal. Timan was a very powerful Ror ruler in the 2nd century AD. Timan Garh Fort has a really some marvelous architecture compared to another fort in Rajasthan. People believe that even today the ancient statues, huge and small statues of mud are hidden beneath the temple of this fort. Beautiful geometric and flower samples on the rooftops and pillars of the temples built here are enough to attract the mind of any tourist. Image of Gods and Goddesses are also carved on these pillars of the temples. This fort was captured by Muhammad Ghori in 1196 and 1244 AD. People believe that even today there is a stone in Sagar Lake near the fort, with the touch of anything that can be of gold.